Saul Canelo Alvarez won’t be fighting WBO middleweight champion Billy Joe Saunders next on May 5th. Eric Gomez says Golden Boy Promotions is focusing on making the Canelo vs. Gennady Golovkin rematch isn’t ruling out a future fight between Canelo and Saunders. Saunders doesn’t have the right style to fight Canelo. Nowadays, to get a fight against Canelo, you have to be willing to brawl with him. He had bad experience with Erislandy Lara in 2014, and he doesn’t want to fight another Lara-like opponent. The southpaw Saunders was a carbon copy of Lara last Saturday night in beating former IBF middleweight champion David Lemieux. After the lackluster fight, it appeared Saunders understood that he wasn’t going to get a shot against Canelo. Saunders proudly told the media that he probably scared Canelo and Gennady Golovkin away with the performance. Saunders may not have scared those fighters with his performance, but he definitely didn’t help himself. Saunders made sure that Lemieux didn’t land any of his power punches by staying on the move for 12 rounds, and giving him almost no chances of landing his big punches. Saunders scolded the audience after the fight for them booing him. That was the worst thing that Saunders could do. He wasn’t going to change the perception of the boxing fans by lecturing them for booing him. The fans wanted to see a fight, and they didn’t see it. Poor Saunders. He thought he was earning a fight against Canelo last Saturday night against Lemieux. Instead, it appears he’s earned a fight against Danny Jacobs, who he’s shown no interest in fighting. Saunders had a chance to cement his position as an opponent for Canelo or Golovkin if he’d gone out and stood in the pocket for 12 rounds and thrown bombs. When you’re trying to impress the best, you’ve got to resist the urge to fight in a safety-first manner like we saw from Saunders. You’ve got to earn that big payday by taking risks. 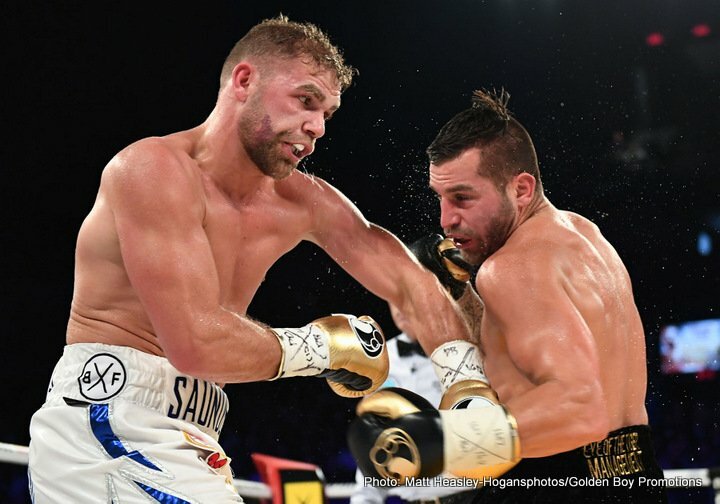 Saunders was not in the risk-taking mood last Saturday night in his fight with Lemieux. “Canelo already fought with a similar style with Erislandy Lara and he passed it, so that we keep, the focus is the tiebreaker,” said Gomez in saying he’s not interested in matching Canelo against the Lara-like Saunders. Who knows? Gomez may revisit the Saunders fight in 2018 if Canelo beats Golovkin on May 5. Canelo might be interested in fighting Saunders for his WBO at that time. I wouldn’t bet on it though. Canelo is less driven by the desire to collect all the middleweight titles, and more interested in fighting the biggest fights. Canelo vs. Saunders would be lucky if it brought in 300,000 buys in the U.S. It would be like a rematch between Canelo and Liam Smith. There was almost no interest in the Canelo-Smith fight, as we saw with the low PPV totals for the fight.